Happy Friday! I hope this week was a good one and I hope the weekend is an even better one. You all know that I love Pinterest and the quotes that other post. But this one stuck out. The sayings goes “people always believe the grass is always greener on the other side”. I believe the grass is greener where it gets proper nourishment. So when I saw this quote I was too excited because the writer truly nailed it! Why should you spend your days worrying about the next person or trying to keep up with the “Jones'”? 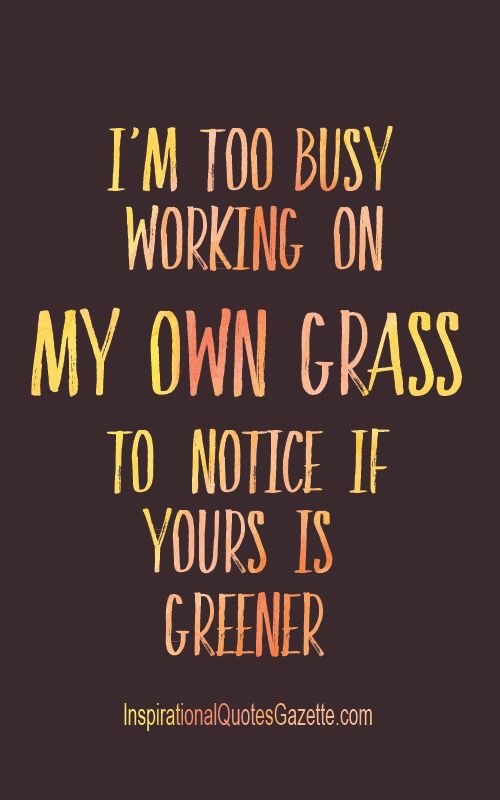 Work on self and you will reap the benefits. I’m always watching these beautiful models with their awesome physique and then I get down and say I wish it were me. Some I can consider inspiration and I will follow what they are doing to maintain their “perfect” body and once again I’m comparing myself. After a while I have come to the conclusion that if I want to be in better shape, I need to start from within. Earlier this month, I had blood work done and my new doctor called me one night and gave me the run down of everything. I knew my glucose level was probably high, and I have a history of high cholesterol. Therefore, I was extremely nervous to hear my results. To my surprised, I was doing better than I thought! My cholesterol is now considered borderline high, which, when I was 22 it was extremely high and my old physician said I could have a heart attack by 25. My glucose levels are in between but I’m not diabetic, thank God! So, he has me on a 3 month plan to exercise more and choose better food options. I know for myself, I also need to concentrate or stress management. Instead of concentrating on other figures of others, I will focus on getting myself healthier. I believe when that happens, so will the physique I wish to have, will come too. Friends, I hope this can be applied to you and in your life. This can be about finances, career, lifestyles and relationships. If you nurture yours, you will see results. Hope this helps! Until next time!